SPOTTED: A Rainbow with No Colors! Isn’t This Amazing? Have you seen a rainbow that has no colors? Is there even such a thing? Well, actually there is! 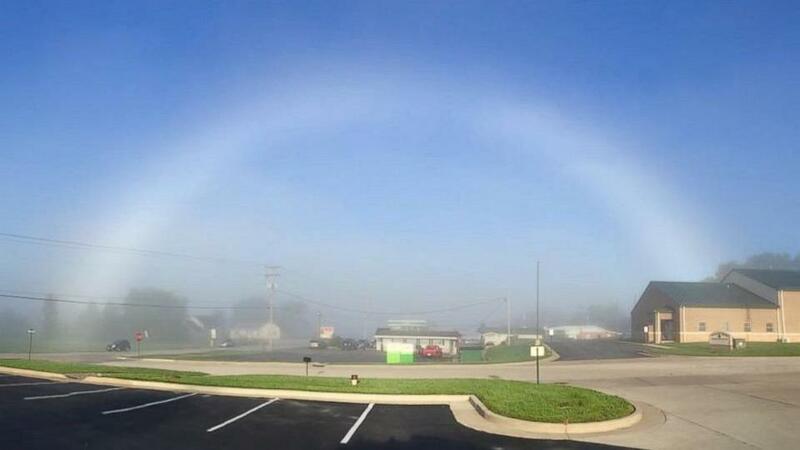 Called a “fogbow”, this phenomenon is shaped like your typical colorful rainbow but lacks color and often appears to be white. Of course, we know from science that in the visible spectrum, white is the presence of all colors; thus, technically, the fogbow is colorful – but our eyes just don’t see the actual colors in its composition! Yeah, I know. That’s kind of confusing! LOL. Anyway, the reason why fogbows appear white and foggy is that the water droplets have smaller droplets of water than your typical rainbow. For this reason, the fogbow typically has very weak colors, if any. There’s a bluish inner edge and a reddish outer edge but it is mostly white. While traveling one day, Tammi Elbert of Washington, Missouri spotted one along the road and immediately stopped to take some photos. She enjoys taking photos of weather and storm conditions but this was the first that she has ever seen a colorless rainbow. If I hadn’t heard of this fogbow here, I would surely feel scared if I see one myself – and maybe think that it is the end of the world! Ooooops.